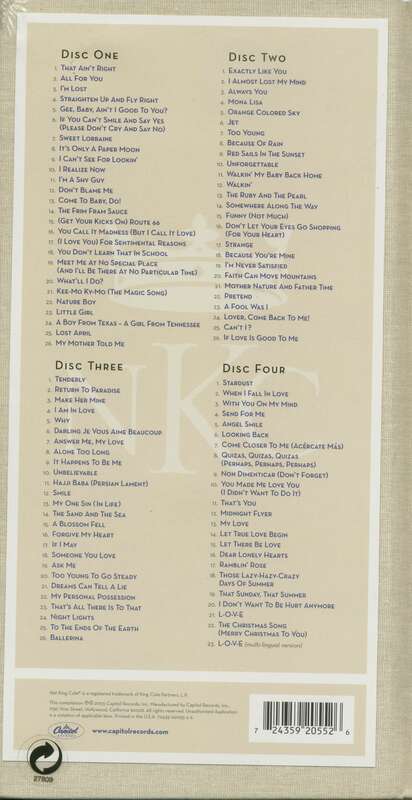 (2003/CAPITOL) 101 tracks - Deluxe US Longbox Digipack A state-of-the-art collection of 24-bit digitally remastered songs! Many available on CD for the first time! 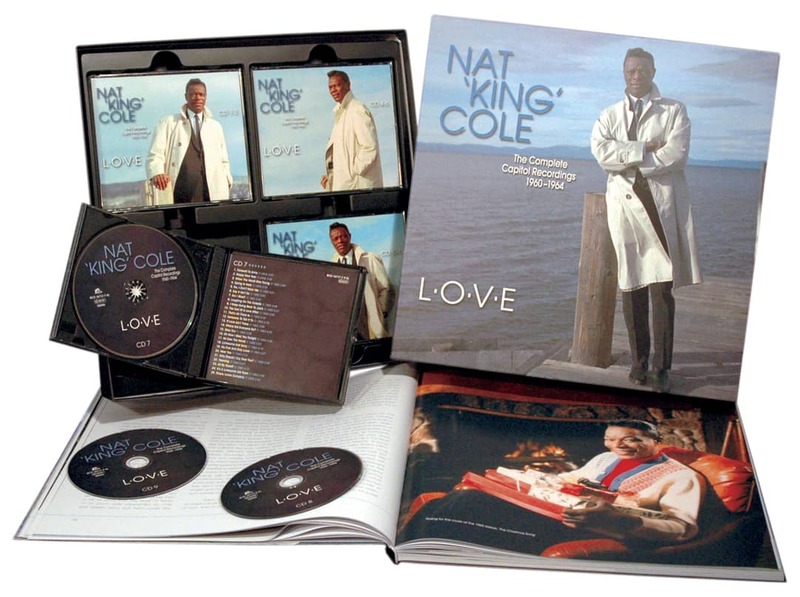 Beautiful 60-page book extensive liner notes, great photos and a track-by-track discography that spans Cole's brilliant career. 05 Gee, Baby, Ain't I Good To You? 13 Come To Baby, Do! 24 Lover, Come Back To Me! "Some performers - like myself - have to be loud and rambunctious. But Nat was just Nat." For most of his career, not only did a significant portion of Cole's material come from outside the United States, a large percentage of his market resided there as well. 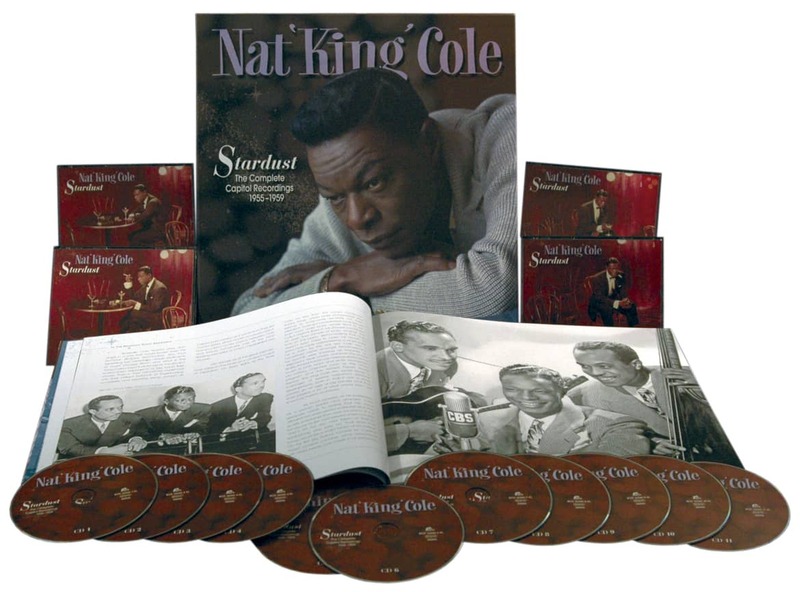 Around the same time A Blossom Fell was released in America, Cole's disc also charted in the song's native country, where Cole's version climbed considerably higher than rival recordings by home-grown crooners, Dickie Valentine and Ronnie Hilton. 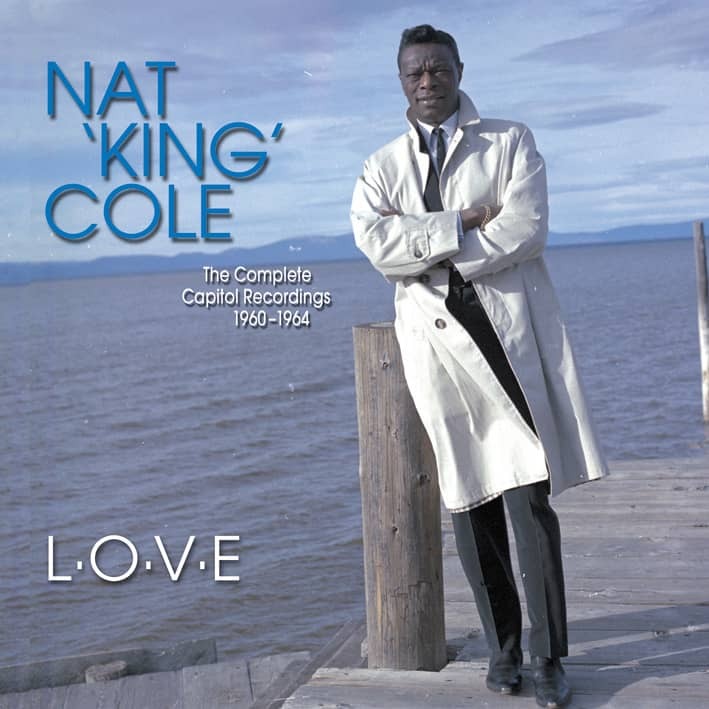 The song is also an archetypical Nat King Cole hit in that, with no disrespect intended to Mr. Valentine and Mr. Hilton, I doubt that anyone would remember this particular song – and many others - were it not for Cole. In a sense, this was the opposite of the traditional path into The Great American Songbook. In many cases, the original source of the great songs is irrelevant; only scholars and music nerds would care that All The Things You Are was introduced by a singer no one has ever heard of (even in 1939) in a show called 'Very Warm For May' that quickly flopped. A Blossom Fell is precisely the reverse scenario: we care about the song only because Nat Cole had a hit with it. We would have no reason to remember the song were it not for Cole; he not only put it on the map, he was the whole map. 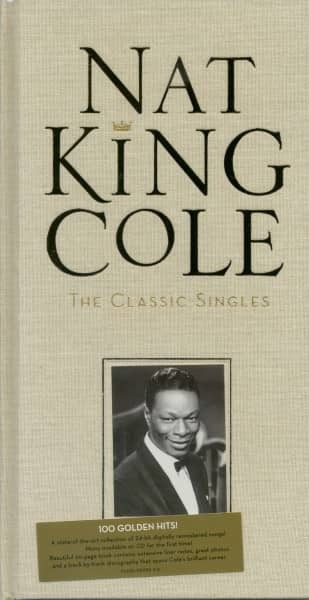 Even though it has been recorded by a handful of other singers, the song's only cred comes from the Cole-Riddle hit recording. The Austrian jazz singer Simone Kopemajer recently included it on an album because, as she told me, she loved the Cole performance of it. To Frau Kopemajer, Blossom represents a slice of the Great American Songbook and of the Cole canon – I don't think she was aware that the song had actually originated in Europe. But in contrast to All The Things You Are - which is, admittedly, an unfair standard of excellence to compare it to - A Blossom Fell is by no means a classic example of songwriting. The lyric pivots on two points, the first being the use of plants as a metaphor. 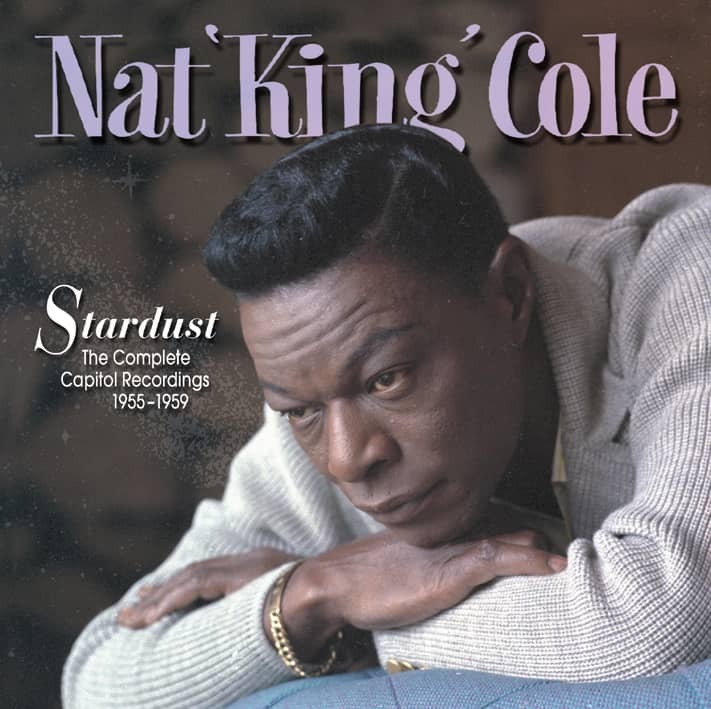 Cole would sing other songs that used variations on this idea, most notably the famous Blue Gardenia (1953), the obscure Sweet William (1952), and the classic Autumn Leaves (which he would perform for the first of many times later in 1955). The lyric also employs another time-honored conceit of songwriters: the idea that gypsies, being fortune-tellers, are a race of mystics who have the inside dope on fate. While many of the ethnic stereotypes of Tin Pan Alley had disappeared by the postwar era, the preconceived idea regarding gypsies was apparently alive and well. In songs like Golden Earrings and The Gypsy (and even Cole's own, earlier That Ain't Right), lovers evaluate their affairs based on tell-tale signs read by gypsies in tea leaves and crystal balls. I have no idea if the tradition presented in A Blossom Fell is a genuine gypsy custom, or if it was invented wholly for the song. In fact, it's kind of an awkward idea, one of those concepts that's so goofy, I would almost like to think it really was part of the folklore of real-life Romany. According to the lyric, if two lovers are sitting beneath a tree, exchanging vows of affection, and a blossom happens to fall off a branch and touch the lips of one of the two lovers, it means he or she isn't telling the truth when he or she says he loves him or her. It's an awkward idea to express in song, and make no mistake, it is very awkwardly expressed. The song opens, "A blossom fell / From off a tree / It settled softly / On the lips you turned to me." That's the A section, and the last two lines are very cumbersome. They make little sense when you read them in print, especially considering that even if this is a genuine gypsy tradition, it's certainly one that not many people would be familiar with. As the late Sammy Cahn once observed, it's a mortal sin for a lyricist to put something in a line that has to be explained: a songwriter's job is to make his point immediately understandable, and if it's deep and profound, like Cole Porter or Alan Jay Lerner, so much the better. The most obvious point was that only a really top drawer vocal artist - a Cole, a Sinatra, a Clooney, a Holiday - could take a lyric like this and not only make it crystal clear, but sing it so compellingly that millions of listeners would want to rush out and buy the single. As he so often did, Cole compensates for any inadequacies a text might have - he puts over exactly what the lyricist wanted to say even on those frequent occasions where the lyric is lacking. The lyric needs help, and it gets it. Arranger-conductor Nelson Riddle does the same for the melody: he opens with a glorious string flourish that actually suggests the wind blowing threw leaves and branches in a cherry orchard with blossoms falling all over the place. The secondary voice on Blossom is valve trombonist Juan Tizol, who appears frequently on Cole's sessions in the mid-'50s, most prominently on the 1956 album 'After Midnight.' (When Cole remade the arrangement in 1961, he took the chart slightly slower and replaced the valve trombone with the customary slide instrument.) Yet Riddle doesn't deserve all the credit; Cole, more than nearly all other pop singers, had a unique capacity for improving any melody, for emphasizing the parts of the tune that worked and minimizing its shortcomings. It's no insult to Sinatra to say that, for all his musical strengths (including a remarkable sense of timing), that he had to take a backseat to Cole in the realm of pure melody. The only major singers who compete with Cole in this respect were Ella Fitzgerald and Sarah Vaughan. But neither of those grand divas was the interpreter that Cole was. Bing Crosby or Carmen McRae could have sung A Blossom Fell and put the meaning across, but Cole does something I don't feel any other singer could have possibly done with it, and that is to make us believe it. Cole sings it as if he was imparting wisdom gained from actual experience, and he makes the words and music sound unique to his idiom. As much as I love Sinatra, I somehow don't think he could convince me that he exists in this particular world - a stylistic universe where liars can be readily identified by the blossoms sticking to their prevaricatin' lips. I don't mean that at all disingenuously: Cole makes you believe it in the most literal and direct way. There never would have been any Watergate or Monica-gate in this world, because Nixon and Clinton would have had blossoms all over their faces. Nat Cole is the kind of talent that's hard to fully fathom in the world of 21st century popular culture - where almost nothing means what it's supposed to mean. Everything in the millennial era would appear to be ironic or sarcastic, a series of codes where meaning is hidden and nothing is obvious. Yet Cole is precisely the opposite: when he sings about blossoms falling on the lips of liars, he doesn't mean it metaphorically, he isn't singing symbolically, he means exactly what he sings. In fact, the song is precisely suited to Cole, not Sinatra or anyone else, great as they may be, simply because in this world that he creates, Cole himself would never have a blossom stuck to his own lips. If the song has any kind of symbolism at all, it's that which describes the singer himself. Customer evaluation for "The Classic Singles (4-CD Deluxe 60 Page Digibook)"